Over the last few decades, emissions of major air pollutants from transport have decreased. However, road transport remains one of the most significant sources of air pollutants. In 2014, road transport contributed about 52% to total emissions of nitrogen oxides in Slovenia. In the period 1990–2014, emissions of acidifying substances from the transport sector were reduced by 46%. In the same period, emissions of ozone precursors and particulate matter from transport were also reduced (by approximately 63% and 18% respectively). This indicator shows the transport emissions of acidifying substances, ozone precursors, particulates, methane and carbon dioxide. All transport modes are included (road transport, rail transport, air transport, maritime and inland waterway transport and other non-road transport). The structure of emissions substances and emissions from passenger car transport are presented. Acidifying substances include: sulphur dioxide (SO2), nitrogen oxides (NOx) and ammonia (NH3). Ozone precursors include: nitrogen oxides (NOx), carbon monoxide (CO), methane (CH4) and non-methane volatile organic compounds (NMVOC). An ozone precursor is a substance contributing to the formation of ground-level (tropospheric) ozone. Particulate emissions can be subdivided into primary and secondary PM10 particulates. Primary PM10 particulates have a diameter of 10 μm or less and are directly emitted into the air. Secondary PM10 particulates or particulate precursors that include NOx, SO2 and NH3 emissions that are transformed into particulates with a diameter of 10 μm or less as a result of photochemical reactions. National database on air emissions, Greenhouse gas database, Slovenian Environment Agency, 2016. To reduce national emissions of nitrogen oxides to 45 thousand tonnes, sulphur dioxide to 27 thousand tonnes, non-methane volatile hydrocarbons to 40 thousand tonnes and ammonia to 20 thousand tonnes by 2010 as required by the Protocol to Abate Acidification, Eutrophication and Ground-level Ozone (Gothenburg Protocol) to the Convention on Long-range Transboundary Air Pollution (CLRTAP) and Directive 2001/81/EC on national emission ceilings for certain atmospheric pollutants (NEC Directive). 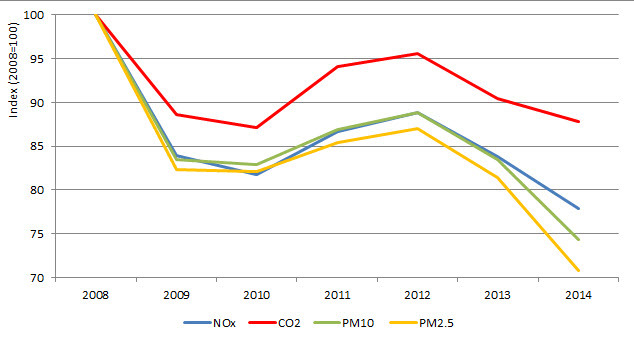 National emission ceilings are not to be exceeded after 2010. According to the revised Gothenburg protocol, emissions of nitrogen oxides are to be reduced by 39%, sulphur dioxide by 63% and ammonia by 1% by 2020 compared to emission values in 2005. The legislation does not specify limit values for the transport sector. To reduce greenhouse gas (including methane) emissions by 8% in the period 2008–2012 compared to the values in 1986. The legislation does not specify any direct goal as regards greenhouse gases emitted by transport. Transport is one of the main sources of emissions of acidifying substances, ozone precursors and particulates. The greatest source of these emissions is road transport, contributing more than 80% of most pollutants. Nevertheless, the data shows that emissions from car transport in Slovenia were reduced in the period 2008–2014 as follows: NOx by 22%, CO2 by almost 12%, PM10 by 26% and PM2.5 by 29%. In the period 1990–2014, the emissions of acidifying substances from transport were reduced by 46% and of ozone precursors by 63%. In comparison to 2000, emissions of particulates were reduced by 18%. The reduction is primarily a result of stricter emission standards for motor vehicles, newer vehicles and lower content of sulphur in fuels. In the years 2009 and 2010 a considerable reduction of emissions was observed compared to 2008, which was a consequence of the economic crisis and the resulting reduction in fuel consumption. The acidification of soils and waters is caused by emissions of sulphur oxides, nitrogen oxides and ammonia into the atmosphere, and their subsequent chemical reactions and deposition in ecosystems, which causes damage to ecosystems, buildings and materials (corrosion). The negative effects of acidification depend on the acidification potential of a pollutant and the properties of an ecosystem or a material. The most important acidifying pollutant in transport is NOx. Although emissions of nitrogen oxides from transport in the period 1990–2014 decreased by 30%, they contributed 96% to overall acidification in 2014. NOx and NH3 also cause exceeding accumulation of nitrogen in soil and waters (eutrophication). Tropospheric ozone is a result of complex photochemical reactions in the lower layer of the atmosphere; its precursors, primarily NMVOC, NOx, CO and CH4 are the highest contributors to its formation. In Slovenia, transport is the most important source of ozone precursors. Among the substances that contribute to the formation of ozone, nitrogen oxides had the largest share (79%) in 2014. Ozone concentrations depend mainly on weather during the spring and summer months; therefore, they fluctuate significantly over the course of the year. Furthermore, the transfer of ozone concentrations across borders is also important. For Slovenia, especially the Primorska region, the Po Plain in northern Italy, where larger amounts of ozone are generated, presents a significant source of ozone. Ground-level (tropospheric) ozone adversely affects the health of humans and ecosystems. High concentrations of ground-level ozone affect the respiratory system (especially lungs) in humans, while in ecosystems, they reduce crop yields, cause damage to leaves and reduce resistance to diseases. Ozone also causes damage to plastic and rubber. Emissions of primary PM10 particulates and their secondary precursors (NOx, SOx in NH3) decreased by 18% in the period 2000–2014, mostly due to reduced SO2 emissions. Nitrogen oxides were the greatest contributor (92%) to particulate emissions in 2014. Individual pollutants have different potential for the formation of secondary particulates. Particulates present a big problem in the urban environment not only in Slovenia, but also elsewhere in Europe. The inhalation of particulates can cause more frequent and more severe respiratory diseases, which increases the possibility of premature death. Smaller particulates are especially hazardous as they can penetrate deeper into the lungs. They also cause lung cancer. The objectives of improving air quality are stipulated by European legislation (Directive 2001/81/EC on national emission ceilings for certain atmospheric pollutants [Directive NEC]) and the Protocol of the 1979 Convention on Long-Range Transboundary Air Pollution to Abate Acidification, Eutrophication and Ground-Level Ozone. The control and reduction of emissions into the air is also the objective of the National Environmental Action Plan for the period 2005–2012 and the Operational programme for complying with national emission ceilings for atmospheric pollutants. The implementation of measures is aimed at air quality improvement. The most important measures include a reduction of individual passenger car transport in urban areas, especially when it comes to short distance travel within cities, an increase in the use and the improvement of public transport, higher prices for parking in city centres, transfer of freight transport to railways and its reduction, strict enforcement of parking regulations, reduced prices and improved services in public transport, higher road charges for cargo vehicles, promotion of the use of more environmentally friendly passenger cars, strict control of catalytic converter efficiency, prevention of cross-border pollution by stricter implementation of European mechanisms related to international agreements (protocols and conventions) and international bilateral cooperation.